Our first night in Huntington we stayed at the Hilton Beachfront Resort. Our house was not available until Monday. I do not recommend the Hilton. While the room was nice, and the view great, there was much left to be desired. I thought it would be fun for the children to have a swimming day at the pool. Unfortunately the weather did not cooperate. It was windy and about 60 degrees. But we made a valiant effort regardless. Perhaps it would have been okay if the hotel hadn't decided on this particular day to replace their transformer, causing the entire hotel to lose power. They failed to mention this slight inconvenience. Think hauling a pregnant body and 3 kids up 11 flights of stairs, in our swimming suits and flip flops. We still may have been okay with the hotel if maybe our "snack dinner" hadn't cost $100 for side salads and extremely unhealthy grilled cheese for the kids. Frustrating to say the least. Mimi and Papa arrived Monday afternoon. We moved into our beautiful rental house, a block off the beach. (I found it on a website called Vacation Rentals By Owner, it wasn't a steal but it is still off peak and so it was a bit better than usual.) It had this fabulous porch to sit on in the front of the house. I spent hours sitting there, soaking in the Vitamin D and reading, and speaking with Brent's parents all about Nibley, materialism, our responsibilities and requirements pertaining to the law of consecration, children...It was so pleasant and relaxing. 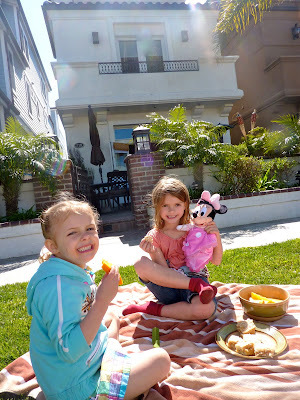 The girls romped around, trying to sell dandelions and water in dixie cups for $1. 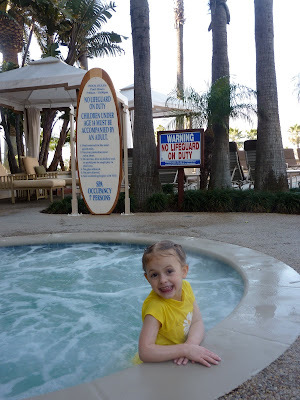 The children all enjoyed the luxurious "jet ski" tub. If it has jets, it is a jet ski tub. They especially enjoyed extravagant bubble baths everynight they could talk us into it. 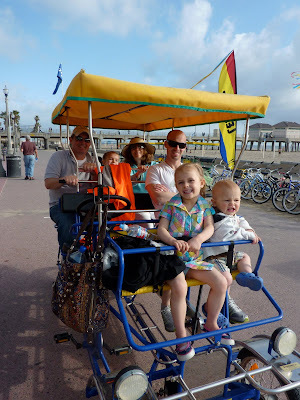 We tried our luck riding this family bicycle on the boardwalk. I will freely admit, and we all did, Brent did the majority of the work. With a single gear it was a bit rough going in places! 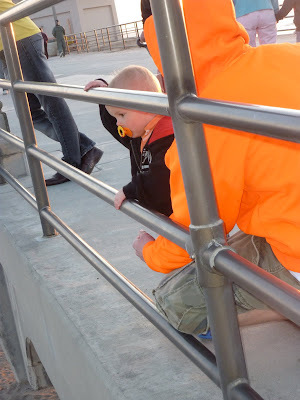 Emmett was enthralled watching the women volleyball players from the pier. Oh no. Already? Thank goodness Uncle Jesse was kind enough to give Brent this subtle sweatshirt while we were in Las Vegas. I may not have been able to keep track of him without it. I certainly wouldn't want him wandering around aimlessly lost among all those bouncing, bikini-clad volleyball players. (Brent says I need to clarify here, there were only about 6 of them, and they weren't even cute.) Whew. Of course, we had to eat at Duke's, the classic restaurant on the beach. It is our favorite in Hawaii, we've eaten at the one in Tahoe, and now in Huntington beach. We actually ate there twice and the children loved it. One thing I have learned is steer clear of childrens menu's. Who decided the best foods for kids are deep fried chicken fingers, grease laden grilled cheese, mystery meat hot dogs...need I continue? I always order a meal from the adult menu for all three of our children to split. Their favorite at Dukes was the Opah fish. We had a both, and this one restaurant and it made a world of difference. Emmett was actually manageable, because he could run around behind us all. Certainly, whenever the weather and wind cooperated we headed down to the beach. The house was equipped with beach cruisers, wagons, sand toys, beach chairs, it was fantastic. Emmett was actually a bit of a stinker this trip. He got pretty tired and wouldn't give Mimi and Papa the love they are so accustomed to receiving from him. This was a typical face for this trip. What a faker. I know. 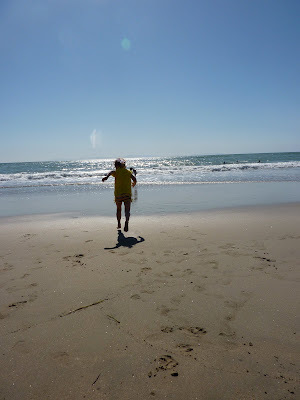 I was certain to get lots of snapshots of Callista on the beach. And notice the great pier in the background. She still mourns over how she didn't get to go to "Heewaii." I had no idea it would be so emotionally traumatic for her. This was her first real trip to play at the beach and she loved it. I love her wiry little frame. The way she moves, and the tone of her body, it is like every muscle is on alert at each moment, ready for movement. The water was so cold! I longed to slip into the Black Pearl (remember my ultra cool wet suit I bought last year for triathloning, in my peak fitness physique) and slide into the water and duck through waves. But alas, it was certainly not to be. I think the Black Pearl would make to my calves and I'd be in eminent danger of losing circulation. Callista loved to make sand castles with me. I taught her all the finer points of sand castle making, from my early adolescent days of living on the shores of Lake Michigan, in the gorgeous dunes of Holland. Ellery's favorite was to comb the empty beaches for sea shells with Papa. She filled all his hands, pockets, and anywhere else they could stuff them. One of the things unique to Huntington beach is there are no houses on the beach. It is open beach for miles and miles. It is great because in town, and from our house, there are unobstructed views of the ocean everywhere. Plenty of room for crazy kites, lots of volleyball and tons of surfers. I think my favorite part of this vacation, was simply the time to sit around and talk as adults. On the beach, the porch, in the car...It was so relaxing and intimate. We will surely be returning to Huntington Beach. Wow, that sounds wonderful! I can't get over the house, the awesome bath tub and how you had strollers, beach chairs etc! Did you know you were renting from a family with kids or what? That is so awesome! 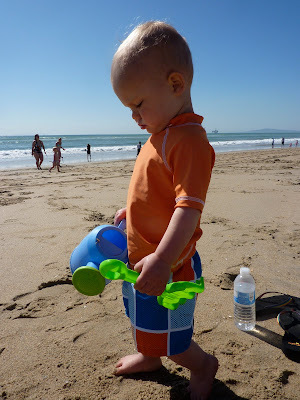 Beautiful pictures, I love how the beach can entertain children for hours..such a great place to be.